Limnobium spongiosa (Bosc) Rich. ex Steud. American spongeplant is native to the southeastern states. 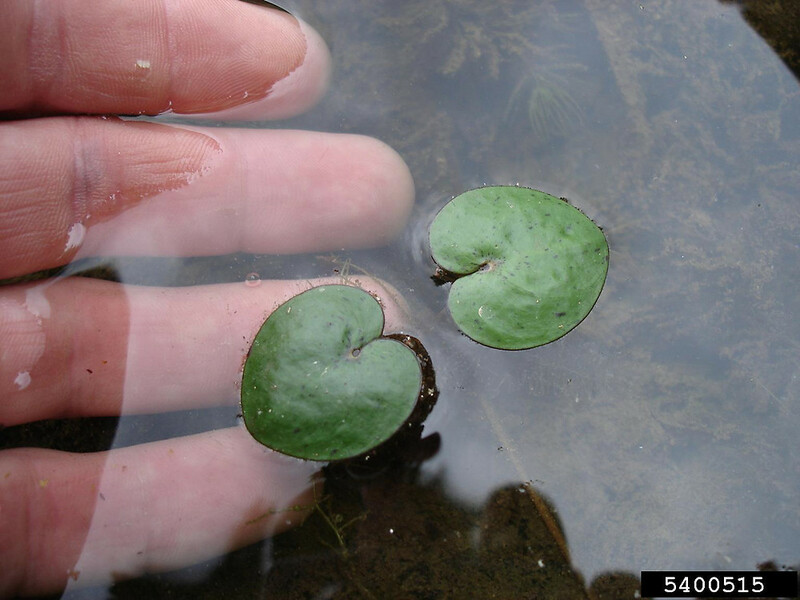 It has thick, spongy, floating leaves and thinner emergent leaves that lack the spongy tissue. After fertilization, the peduncle curves down, so that the developing fruit is pushed underwater. primary lateral veins of leaves diverging from midvein at an angle of 75-90 degrees and all leaves having aerenchyma tissue confined to each side of the midrib on the abaxial surface (vs. L. spongiosa, with primary lateral veins of leaves diverging from midvein at an angle of 30-80 degrees and floating leaf blades with conspicuous aerenchyma tissue extending nearly the entire width on the abaxial surface). American spongeplant. Hydrocharis spongiosa Bosc • CT. Pond shores. 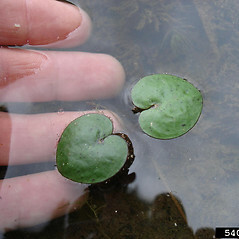 This species forms two types of leaf blades—floating ones with conspicuous aerenchyma tissue on the abaxial surface and emergent ones lacking the prominent aerenchyma tissue.